The First Grade program meets 3 days a week, Tues/Thurs 9:15-3:15 and Wed 9:15-2:00 pm. You may choose to attend Tues/Thurs only as well. These grades are combined with K for some subjects such as history, science, art, and Spanish; but are separated for language arts and math classes based on their reading level. All students are placed in Math and Phonics/Literature classes based on their ability level. For other classes, they are grouped with their age level. The science and history in this age level are suitable for beginning/emergent readers as well as more advanced readers, and will be engaging and challenging even for advanced students. LEAD INSTRUCTOR: Ms. Mandy Zatopek. Ms. Mandy will be teaching phonics, literature, and reading for the 1st grade students. Students will rotate through other instructors for their other classes such as science, history, and music. The following classes are included in the Forest Path Curriculum. This class is designed for all new first grade students as well as second grade students who are still “emergent” readers. If your child can read words like “cat” “dog” and “snack” but does not yet read fluently, this is the class for your child. The emergent reader class meets three days a week. We offer a strong phonics program based on Orton Gillingham methodology. We use primarily Saxon Phonics 1 as their main curriculum but supplement with other programs including All About Spelling / All About Reading and Explode the Code. First Grade students will explore a variety of quality literature selections including Caldecott winners such as Tomy DePaola, Maurice Sendak, Kevin Henkes, Robert McClosky, and many more. These books will be read out loud to the students and parents will be asked to read out loud to their children at home. As the year progresses children will receive their own phonics readers to practice reading at home. Handwriting without Tears- Printing Power. Students will learn correct letter formation and practice writing correctly. Our core workbook will be the Saxon math, but we supplement with other curricula. Students will learn adding and subtracting plus topics such as calendar, patterning, shapes, and more. We utilize both Math Centers with manipulatives and traditional worksheets. 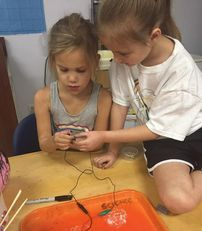 Students will explore and learn through hands on experiments and science centers topics such as the human body and my five senses, animals and habitats, biomes, classification, plants, lights and mirrors, simple machines, and more. Students will learn about our city and state as well as important people in our community. We’ll learn about important symbols of our country and our state. Later we’ll cover a variety of famous historical figures such as Abraham Lincoln, Thomas Edison, and many more. Our Spanish Enrichment classes will introduce the Spanish language and Latin American/Spanish cultures in a “fun” atmosphere. There will be a variety of activities including flashcards, videos, games, and songs. We will learn colors, numbers, the alphabet, lots of vocabulary and more! The skill level taught will vary with the age of the student. Our goal will be to build a strong language foundation while having lots of fun!